As college classrooms have become more linguistically diverse, the work of ESOL professionals has expanded to include research on the experiences of multilingual learners not only in ESOL courses but also in courses across the curriculum. At the same time that ESOL professionals are trying to understand the academic challenges that learners face beyond ESOL courses, faculty across the disciplines are trying to meet the challenge of teaching students of differing linguistic backgrounds. Crossing the Curriculum: Multilingual Learners in College Classrooms responds to these issues and concerns by capturing the complex and content-specific nature of students' and teachers' experiences and providing a nuanced understanding of how multilingual students' learning can be fostered and sustained. *Part One, "Investigating Students' Experiences Across the Curriculum: Through the Eyes of Classroom Researchers," consists of chapters written by ESOL and composition researchers who have investigated multilingual students' experiences in undergraduate courses across the curriculum. 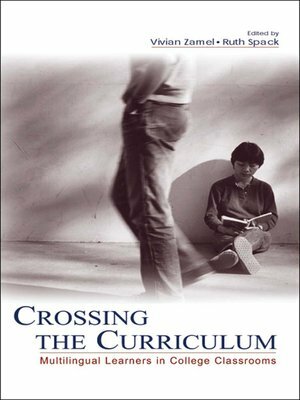 *Part Two, "Learning Across the Curriculum: Through Students' Eyes," consists of chapters written by two multilingual learners who chronicled their experiences as they crossed the curriculum over time. *Part Three, "Engaging Students in Learning: Through the Eyes of Faculty Across the Curriculum," consists of chapters written by faculty from several academic fields—Anthropology, Philosophy, Nursing, Literature, Sociology, and Asian American Studies—who discuss their own attempts to address the needs of multilingual learners in their classrooms.